1. Democratic lawmakers reached a budget compromise with Governor Jerry Brown that includes funding for preschool programs for all low-income four-year-olds and overtime pay for in-home aides who care for the elderly and disabled, the Mercury News$ reports. However, the budget deal also includes demands of fiscal prudence by the governor, including funding a so-called rainy day reserve. In addition, one-quarter of the state’s cap-and-trade revenue will help fund high-speed rail, while a third will go to the construction of affordable housing near major transit hubs. 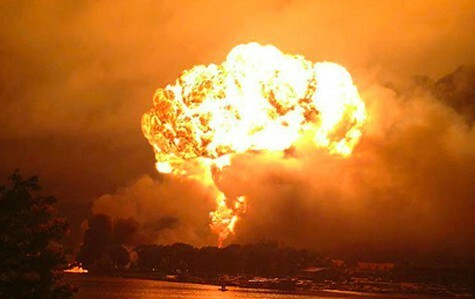 A train carrying Bakken crude exploded and killed 47 people. 2. State and federal officials are refusing to disclose the location of oil-by-rail shipments in California, even those that involve the highly explosive Bakken crude, fracked in North Dakota, the SacBee$ reports. Environmentalists have become increasingly alarmed about oil-by-rail shipments following a series of explosions involving Bakken crude, including one that killed 47 people last year in Canada. Train industry officials, however, say that disclosure of such shipments could expose them to criminal acts. 4. Legislation that would require warning labels on sugary beverages and would ban single-use plastic bags statewide are still alive in Sacramento — despite widespread opposition from industry, the LA Times$ reports. 5. East Bay Democratic state Senator Ellen Corbett continues to trail Republican Hugh Bussell by just 413 votes in the race to square off against Congressman Eric Swalwell this November, the Bay Area News Group$ reports. In addition, Democrat John Perez leads fellow Dem Betty Yee by just 322 votes in the race for second-place — and a spot in the November election — in the state controller’s contest. 6. And the BART board of directors voted to establish a $6 fare for the new Oakland airport connector, the Chron reports.